Pivoted-armature valves are used with a 3/2-way function and in a 2/2-way version. On the 3/2-way Bürkert pivoted-armature valve (e.g. 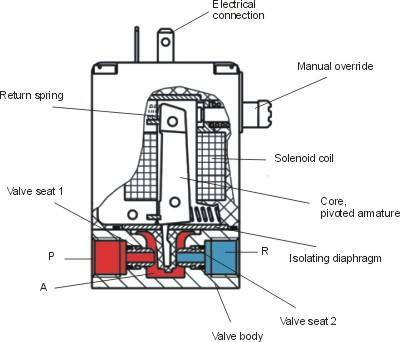 Type 0330, see Figure), all three ports are accommodated in the valve body and an isolating diaphragm prevents fluid from entering the solenoid system's armature chamber. The pivoted-armature valves are equipped with a manual override function (standard) and can also be optionally equipped with a visual position indicator or an electrical feedback indicator.